Centro Joyero, from the series, Into the Sunset. © Leigh Merrill. The reconstructed images of Leigh Merrill mirror the way in which architectural styles are often blended within cultural communities. 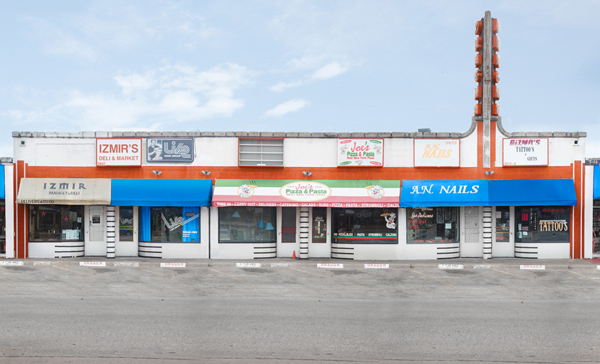 Leigh focuses on re-imaging strip malls found in the southwest. The resulting pictures hold comical and lyrical tones filled with references to cultural stereotypes of this region. Gregory Jones: First off Leigh, how did you get your start in photography, and who do you count among you biggest influences? Leigh Merrill: I find influences in what surrounds me – what I may see on a morning walk, something I read, listen to, look at – all can sometimes spark an idea and get things moving in a new direction. Most of my artwork is photographic because the ideas in the work rely on the veracity associated with the photograph. Dallas Costumes, from the series, Into the Sunset. © Leigh Merrill. GJ: The images from your project Into the Sunset are assemblages created from dozens of source photographs. The result I find is a colorful and lyrical reconstruction of typically banal subject matter. Please talk a bit about your process, and what significance there is in making pictures in this way. 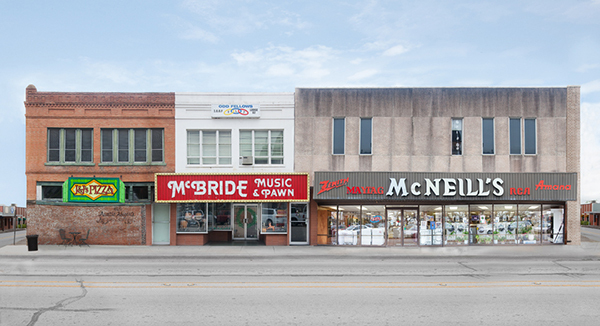 LM: By building my images from many source photographs I am able to highlight elements of the urban landscape that I am most interested in, change or alter the pacing of the street — I like your description of lyrical — I create scenes that feel both familiar and unfamiliar at the same time. Our built environments are composites of different architectural styles and cultures – and so, too, are my photographs – I like that conceptual link. Charco Broiler, from the series, Into the Sunset. © Leigh Merrill. GJ: The landscapes you have constructed in this series are ubiquitous, not only in the southwest but across the nation. Unlike much of the other work this blog has featured, your work strikes the viewer as quite believable, at least at first. Before long, we find ourselves drawn in to a fictional world— a tall tale— another familiar American construction. What do you enjoy about this particular style of storytelling? LM: Sometimes exaggeration is the best way to convey the intensity of a moment, scene or personal exchange. 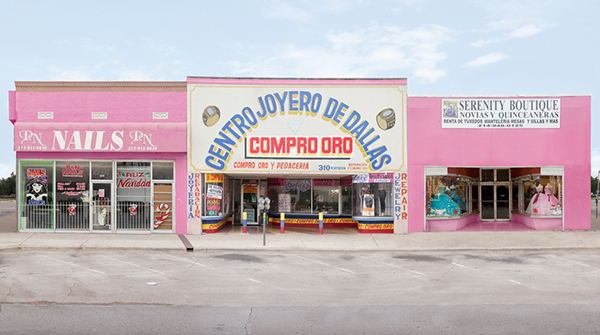 My photographs try to blend the exaggerations of the everyday with larger cultural ideas. By creating images that at first appear believable, there is richness in the discovery of the fabrication. The images are not built to be completely seamless but to have areas that don’t line up – mix-matched perspectives, incorrect reflections in windows – clues to the artifice of the image. However, at some point there stops being a clear ability to distinguish between real and fake. At this point I hope the images stop being about the allusion I have created or the technique I have used to construct the image, but about the place itself. I believe that when we cannot distinguish between truth and fiction, it is because both are a part of our reality. Jack’s $1.00, from the series, Into the Sunset. © Leigh Merrill. GJ: What I love most about this series is the fact that each image has been cut and pasted together using many individual elements. The ease with which the suburban strip mall translates into this environment really fascinates me. The structures are brightly colored yet simple and utilitarian, featuring diverse and often anachronistic architectural elements, and are generally considered eyesores for those very reasons. What first drew you to recreate such a commonly disparaged element of the American landscape? LM: I had just moved to Texas after finishing a project looking at the residential landscape of the San Francisco Bay Area. I went to many cities and towns throughout the north Texas region and found that I was more interested in the commercial areas then the residential ones. There are these charming old main streets and city squares full of one or two story buildings that looked like the “old west” we see depicted in movies and photographs. They reminded me of what I expected to see. I allowed myself to create works that combined both my expectations of this region along with what was actually there. As the project continued it showed not only images that seemed reminiscent of the “old west” but images that are reminiscent of how we perceive the new west – the strip mall and parking lot. I am interested in how much my expectations of a place, through movies and images, become a part of my understanding of a place and its physical construction. In the photograph “Texas Paint and Wallpaper”, I was trying to draw attention to that specifically. There is a building with a mural on it depicting the “old west”. When creating this image I tried to blur where the representation became a part of the landscape. There is moment when the actual sky is almost indistinguishable from the mural on the building. Justice, from the series, Into the Sunset. © Leigh Merrill. GJ: This work is a sort of celebration of the man-made world- from its culture and economy all the way to its physical architecture. But for all its modernity and manicured structures, the world you depict appears unpopulated. If the landscapes might serve as backdrops and stage sets, are there actors? What might be the performance? LM: Partially I was interested in ways to conjure up the idea of movies and photographs, some of the representations that affect our understanding of the landscape, specifically the American West. One of the ways I tried to reference these representations of the West was through the sky in these photographs. I digitally cut and pasted a version of the exact same sky photograph into every picture, moving it or lightening or darkening it slightly for each print. The discovery of the sameness of the sky was meant to be subtle and a way to directly speak to this notion of the backdrop or stage set – as if the sky is a giant studio background behind these buildings. I want these photographs to invoke a sense of heightened expectation, as if something is about to occur or has just ended. I recently finished a series of videos – the continuation of the Into the Sunset project – that combine subtle movements with these urban environments. Texas Paint and Wallpaper, from the series, Into the Sunset. © Leigh Merrill. GJ: Into The Sunset is bright and idyllic, featuring cheery pastels and deceptively simple lines, with subjects seeming at times more like miniatures of themselves than full-scale elements. 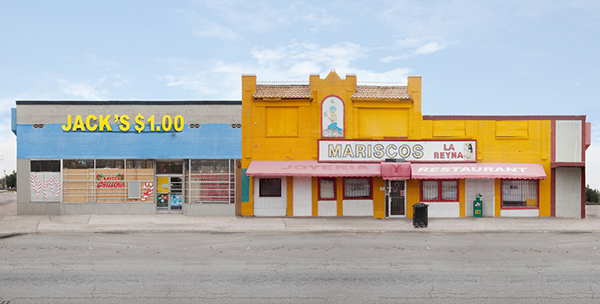 The big blue of the Texas sky has charmed its way into the murals and storefronts, and nearly everywhere are promises of that most favored American pastime – shopping. The culminating photo of this series is titled “The Things We Make, Make Us” and I am curious how you felt you might have been changed by the act of producing this work. I also find myself wondering about the differences between creation and consumption, and what the things we buy might also do to us. Your thoughts? 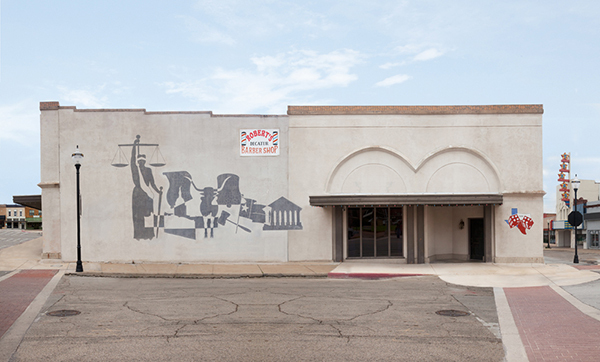 LM: The photograph you mention is one of the more urban scenes depicting a giant billboard in Dallas with a large empty parking lot in the foreground. The ad shows a Jeep driving off-road through the redwoods of the California coast. I was thinking about the idea of manifest destiny coming full circle, where the West Coast meets the Southwest. 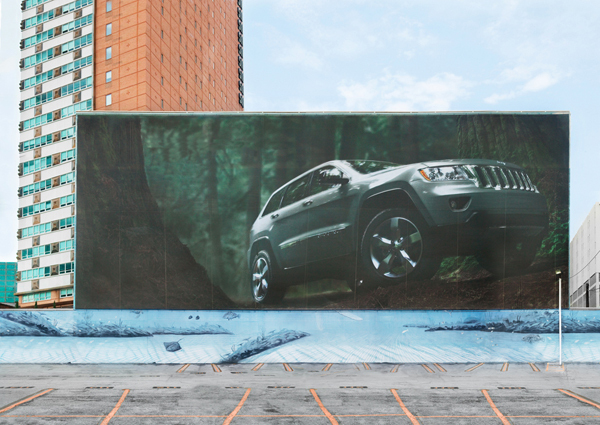 The title of the photograph is derived from a Jeep slogan, “The Things We Make, Make Us”. The title adds a layer of irony and humor, with its layered evocations of Americanism and capitalism and with their environmental and political implications. It also speaks to how some of the ideas of the American West, the heroic individual and constant progress, are built into the very infrastructure of our landscapes. The photograph alludes to some of the complicated ways in which the things we make and consume become physically apart of us. Creation and consumption are different but they can both give clues about the desires of an individual or culture. The Things We Make Make Us, from the series, Into the Sunset. © Leigh Merrill. GJ: Last but not least, what are you looking forward to over the next year, photographically or otherwise? LM: I just finished a series of videos extending the Into the Sunset project. I also just completed a small public art project for a small town in Pennsylvania. With the completion of these recent projects, I am currently sitting in a blissfully clean studio and in that wonderful mindset of allowing myself to play around with new ideas and read books that may offer fodder for upcoming projects. The Dragon, from the series, Into the Sunset. © Leigh Merrill. Odd Fellows, from the series, Into the Sunset. © Leigh Merrill. Leigh Merrill received her BFA from the University of New Mexico in Albuquerque, NM in 2001 and her MFA from Mills College in Oakland, California in 2009. Merrill’s work has been a part of exhibitions throughout the United States in venues such as the Phoenix Art Museum, the diRosa Art Preserve, The Lawndale Art Center, the Tremaine Gallery, and the Orange County Center for Contemporary Art. Merrill’s work has been included in online publications such as the Design Observer Places Journal, BLDGBLOG and IGNANT. Her work is part of the collections of the City of Phoenix, the California Institute of Integral Studies, as well as various private collections. Interview written by Gregory Eddi Jones and Meghan Maloney.